Mazda has launched updates to two of it’s Mazda RX-8 models, one of which will go on sale today and the other in mid-November. 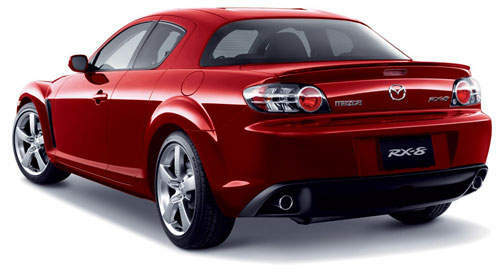 The new standard Mazda RX-8 Type S (6-speed manual transmission) and the Mazda RX-8 Type E (4-speed Activematic auto transmission) received two new colours which are Galaxy Gray Mica and Phantom Blue Mica. It also got a new interior design. Other enhancements include a factory-installed keyless entry and start system. Adds to the cool factor indeed! 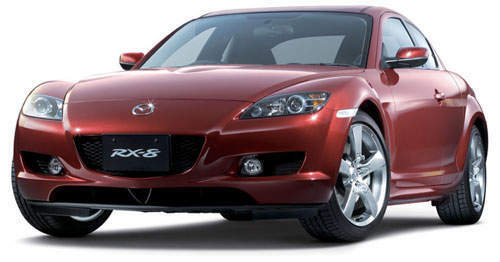 As for the Mazda RX-8 Sport Prestige Limited II Special Edition, the 2006 model has been updated with new seats made with a mix of alacantra and leather. 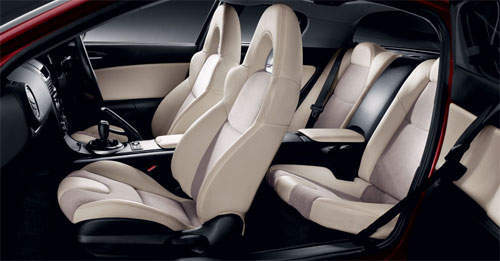 The interior is sand-beige colour themed. Steering wheel and handbrake is wrapped with black leather. In the exterior, lamp bezels have been given new glossy paint. I personally don’t like lamp bezels that are too outstanding. The model also gets a new exclusive colour called Copper Red Mica. The sports rims for the automatic model has been upgraded to 18 inch where it was 16 inch before. The delicious rims are wrapped with 225/45/R18 tires. A new rear lip spoiler has been added.